A permanent solution for the homeless and unemployment problem in the United Kingdom. Proposal: A permanent solution for the homeless and unemployment problem in the United Kingdom. Idea: A mandatory (government chooses) or self-made (they choose), weekly £1 deduction from the unemployment benefit, crowd funded from over 2,000,000 unemployed people in the UK is transferred into a REIT (The Unemployed Real Estate Investment Trust), a property fund to buy UK nationwide properties for cash which are then owned in a £1 for 1 share structure by those who put in the money who are in fact the unemployed and the homeless, (those on weekly benefits or donations). After 52 weeks the REIT would have a gross income of £104,000,000 (after 1 year) and over £1billion after 10 years which is invested in real estate rented by and remodeled by the unemployed and the homeless. The REIT property management company a separate entity would not take a salary just a gross management fee of 5% to run the REIT. Properties would have no Mortgage or lien (debt) and we would look for properties that need work or remain unsold for whatever reason which could be heavily discounted upon purchase. We would also look at foreclosures and duplexes and apartment buildings. We would also look at properties with land and gardens that would be liked by the homeless. They could literally camp and live outside their own house on their own land if they chose to in good weather, that they have legally bought and remodeled. We would prefer they lived inside their house, but there will be times when a transition is necessary. After year one we would create an App for like-minded people (because they care) who might wish to invest in the REIT to compound the peoples' financial power of purchasing a REIT owned by the unemployed and homeless. But ownership in REIT 1 would always be the unemployed and homeless who paid in because then they will have a residual income and a deed to the property through their shares. We are a pimp of hope and we push dreams with the help of the politicians like the ex-president Barack Obama who has become even more popular since leaving office and we would ask him to be the spokesperson for Crowd Source Capital for the UK homeless and unemployed. Being Homeless can be caused by a multitude of problems and this includes mental illness but this could change with real estate ownership for those less fortunate than the majority but who as a crowd have huge financial purchasing power. Thank you for reading this. I understand this is radical and at the beginning, it is a tiny pioneering solution but over time and with the crowd it becomes a compounded self-fulfilling prophecy. We believe that teaching a man or women to fish (metaphor) in the long term beats charity which needs a residual donation. With this model, the REIT would rise to be a major player in the real estate market changing the situation of the homeless and unemployed permanently over time. We live in exciting times. With every day passing the end game beckons to disrupt the banking system, sometime in 2026, the payment system, our credit cards, banking, virtual currency, the block chain, or let's just call it "money" like the Pink Floyd song, as we know it and ultimately funding new projects with equity or loans for start ups, small businesses or in simple english "ideas". Who will win the financial arms race? The cyber punk futurists, the freaked out bankers, the block chain specialists, the venture capitalists or some one with a really high IQ and a Mensa membership who makes a simple mass adoption that's accepted by regulation (tricky) and the people that's you and me who actually adopt that app, mechanism, or start up. Snapchat is catching up with Facebook, and you tube needs a complete reboot Netflix, Amazon prime, Hulu anyone? Crowd Sourcing and Crowd Funding is littered with expendables like Quirky. It never pays to be first into the space. It's the mop ups that seem to get it right. They learn from other's expensive mistakes and refine, study and usually get lucky. Most success stories were not by design but by being in the right place at the right time. You don't even need an office anymore http://www.wework.com which seems to be replacing Regus with community space! Facebook is now massive $117 - $120 a share but when it floated at $38 a share and dropped to $16 a share who knew. Only with mass adoption on the cellphone did Facebook get it right. Google is still getting there with mobile. My point is with Facebook you have your market already built. The next step with the block chain that trendy mechanism to reinvent secure contracts away from dark web bit coin exchanges and with R3 and now Chain in New York rebooting banking by digitising dollars into the block chain for the banking brands! We used to say dialing for dollars now it's digitising for dollars! It's coming except it won't be instant, it will be stealth, it will crawl up on us by 2026 and by then it will have been accepted. Digitised banking for millennials on the block chain. Our idea is "Block chain equity crowd funding on Facebook, snapchat, what's app, you tube". I love the Bloomberg terminal ad mantra: any platform, anywhere! There is nothing to stop Facebook doing it themselves but they seem more focused on advertising dollars, virtual reality and competing with You tube videos when the biggest prize would be a Facebook bank, crowd funding dollars for projects. It's a Kickstarter meets Facebook play with equity on the block chain. Back in 2009 we bought the domain name crowdsourcecapital.com and more recently crowdfundcapital.com Now in 2016 the next big boom already upon us in Internet start ups is fin tech or financial tech the total disruption of the traditional banking model. Even the banks have realised that they must adapt or die by 2026 with fin tech as part of their business model or be replaced by twenty year olds, millennials whose start ups disrupt as did Amazon, Facebook and Google. Who will be the Google of fin tech? Do you really want to put your money in a bank at 1 %interest and have your bank lend it to their customer at 3,6, or 22%. now the banking system is considering negative interest rates. Now when I say fin tech it comes in many forms. Lending can be peer to peer...the big focus is on the block chain and Bitcoin and Ethereum so that transactions can be coded. As I understand it each transaction can have its own DNA code for security. This is why Microsoft has adopted Ethereum a reboot of Bitcoin but on whole another level. So where does this leave fin tech and crowd funding? Like a Clint Eastwood movie, it's the Wild West all over again. Anything goes because the disruption is disrupting conventional banking. Code, the block chain and an app, well even apps are old school now...how many can you download on your iphone and actually use. 50% of apps are bought and abandoned by the customer. Impulse buy meets reality check! It's time for bots. Crowdbots? So it's time to build a fin tech platform on the block chain of ethereum but with Netflix for projects. A crowd funded ecosystem on the block chain using video as hardly anyone reads anymore...fund a brand anyone? 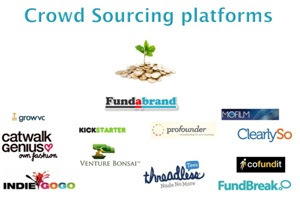 Quietly, Google has been making its way into crowdfunding in a big way (What is crowdfunding?). It hasn't done so by launching large, splashy rewards-based crowdfunding platforms like Kickstarter or peer to peer lending networks like Lending Club. Instead, Google is placing its bets on existing platforms with money from its investment arm, Google Ventures. And rightly so, Google is positioned atop a list of the top investors in crowdfunding and it's done so with investments in equity crowdfunding platforms Angel List and CircleUp and peer to peer lender, Lending Club. We believe our relationship with Google will be very helpful in better serving our customers. We couldn’t be more excited to have them on board. When you look at Google's investment activity in the crowdfunding space, it's clear that the firm believes in the potential of crowdfunding. But some news that the search/technology firm dropped today may point to a more hands on approach it will be taking to crowd funding in the future. With a video and blog post, Google announced some new changes it would be making to the creation tools for publishers of videos on its video network, YouTube. One of those changes would be that YouTube would be joining the crowdfunding excitement. Here's why: Google monetizes the billions of videos watched on YouTube by showing advertisements to viewers. In turn, YouTube shares those revenues with the producers of such videos. But here's the thing: a lot of those videos are made to promote products and services sold off of YouTube. Once someone clicks off a video, YouTube loses the opportunity to make more money off a user. So, this new announcement that Google would begin providing a mechanism for viewers to directly pay the makers of videos on YouTube changes the rules of the game. How will YouTube inject crowdfunding into videos? Sources say that many content creators on YouTube have voiced their frustration that advertising revenues have been dropping over time. That's actually lead to a few of the larger publishers to leave YouTube in search of better revenue-producing platforms. YouTube -- and parent, Google -- recognize the potential size of the crowdfunding market (expected to be worth hundreds of billions of dollars in the future), so it's working hard to collaborate with the Kickstarters and Indiegogos of crowdfunding. Unfortunately, Google's announcement didn't give more details on what crowdfunding would look like or how crowdfunding would work on YouTube, but that hasn't stopped analysts, journalists, and bloggers from speculating. YouTube has been cooperating with crowdfunding sites for some time; Kickstarter and Indiegogo were some of the first external websites that video producers could link to via video annotations. The video service didn’t offer any additional details on what its own crowdfunding features will look like, but given that history, it’s possible that YouTube will try to complement Kickstarter rather than directly compete with it. The iconic Veronica Mars stands as an industry touchpoint for the power of crowdfunding to finance films that may have not found studio backing. While there is no indication YouTube is getting into the film production industry for tentpole movies – a successful funding structure would certainly aid in setting a strategic tack to head in that direction. Whether it's financing new forms of movies or just providing a mechanism to donate money to video creators, it's clear that Google is intent on investment more money -- and resources -- into ensuring that it's a dominant force in the crowdfunding industry. Insane but perfectly feasible crowd sourcing and crowd funding predictions for 2016. Apple will buy Netflix …and here’s why? Apple has been stalled out the gate with their content play, Apple TV package, they abandoned it last month because they could not get the rights to the content they wanted they have left it too late! Tim Cook’ strategy will be to go shopping with the $200 billion he has in cash. Apple will buy Netflix for $50 billion. The algorithm Netflix has created and the deal it has in play and the market mover advantage will kick start Apple TV to form Apple Content. The 60,000,000 Netflix subscribers watch content and tell Netflix by what they click on and for how long and what they watch and when will actually crowd source the data Netflix needs to keep going. To put a crowd sourcing and crowd funding spin on it Apple could fund new content from the 60,000,000 subscribers at $10.00 a month on top of the Netflix existing membership payment, as a standalone investment vehicle to create a Netflix crowd funded studio actually modeled on Disney’s Silver Screen Partners Fund from the 1980s to fund new content that the public have shares in. Imagine not only be a member of Netflix but actually an investor in their content pipeline and get a credit and a return on your investment if they knock it out of the park. Imagine $600,000,000 crowd funded each month for Netflix to create new content for Apple TV. Netflix Studio, Netflix independent, Netflix documentary, Netflix theatre and on and on…In 2016 Netflix will spend $3 billion on new content, imagine Apple owning Netflix letting it run as a standalone but with a crowd funding fund that replenishes every month and is not on the balance sheet of Netflix as debt. Talk about Crowd Source Capital! The Salvation Army charity buys Kickstarter or Indiegogo! Now that Kickstarter and Indigogo are proven business models for rewards crowd funding how about the Salvation Army buying www.Kickstarter.com or www.Indigogo.com with what you say? On January 20th 2004 the Salvation Army received $1.5 billion from Joan Kroc’ wife of McDonald’s founder… she died on October 12th 2003. The $1.5 billion went to building community centers all 35 of them. So the money has been spent, but not leveraged as of yet. However with this model they would have a perpetual income every year. Add www.justgiving.com and they would be a power house in the crowd funding and charity space. Google Ventures decides to invest further in the crowd sourcing and crowd funding space in crowd and on line funding platforms. They have already invested $17,000,000 on top of $42,000,000 in On Deck Capital which raised $200,000,000 in an IPO in 2014 and before that Google invested $125,000,000 in www.Lendingclub.com which floated the same year. So Google Ventures makes a play for www.fundingcircle.com and www.crowdcube.com I am expecting a call from Google Ventures to my office here at www.crowdsourcecapital.com. Just kidding...Google Ventures targets on line platforms specializing in the provision of debt. (see You Tube Enters into Crowd funding by Zack Miller. YouTube will announce in 2016 a new platform partnership between YouTube and crowd funding. It already owns stakes in Angel List and Circle Up. First off it would be callous not to mention last night's madness across the channel. With the attrocities in Paris still fresh on my mind Twitter has shown that the collective village has a soul and people do care. We all support France and especially Paris the most romatic city in the world that just got turded by some brainwashed young french born men. Barely in their twenties they carried out their orders from within France but guided by the head of a serpent who only knows chaos, death and destruction. Whatever your politics surely this is the tipping point of passive aggressive! But then democracy has many jealous ideological enemies. The french are a tough bunch the foreign legion comes to mind and even though Mr Pudding runs the place he is extremely decisive if not economically educated. So closing the borders, locking down Paris with the military was smart. OK so the stock market took a dump on Friday, high street retail is dead just go look at the malls! Duh! long live the internet, and twitter is back below its IPO price at $25.17 While tech has been and still is the actual engine of the USA economy. Silicon Valley is like a Dyson (vacuum cleaner) for brains and funding. I can't help but think that the smartest people in tech are missing a trick, well missing an out of the box helicopter view. 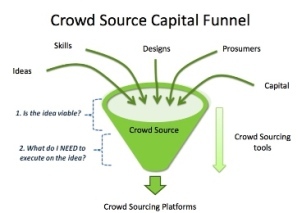 Namely crowd sourcing or crowd funding. Social media is the glue of the internet and its management either monetise it well or badly. Over at Facebook when the stock was $16.00 a share, today its at $107. I remember everyone saying its over, everyone is transitioning to their baby blanket (cell phone, mobile phone) goodbye Facebook. No more desk top Facebook...So what does Zuckerberg do he moves with the crowd and makes Facebook mobile friendly and then adds companies who have built in ecosystems that keep you in the Facebook walled garden. I digress "What to do with Twitter" now that Ballmer has bought a billion dollars worth and that guy in Saudi Arabia Alwaleed In a filing with the U.S. Securities and Exchange Commission, HRH Prince Alwaleed Bin Talal Bin Abdulaziz Alsaud revealed that he now owns 5.17 percent of Twitter’s stock, or 34,948,975 shares. Twitter is saved. Not exactly...its stock went up and now its back down. On October 30, 2015, the U.S. Securities and Exchange Commission (SEC) adopted final rules under Title III of the JOBS Act to enable U.S. companies to offer and sell securities through crowdfunding (Regulation Crowdfunding). This alert provides an overview of the SEC crowdfunding rules slated to become effective in early May 2016, with certain related forms, such as Form Funding Portal (which will be used to register as a funding portal), becoming effective at the end of January 2016. Aggregate your users into a funding aggregation tool using the tweet as the pitch. Buy Kickstarter and Indigogo and hook up with apple pay. Just imagine twitter "we fund any idea, company, start up, anywhere on the planet, anytime, 24 hours a day, seven days a week." Do what Hollywood does er I mean Netflix and Amazon Prime and Hulu do, make a pilot and then ask the crowd if they like it by watching it. Put in a button with three clicks to funding. *Twitter will become a marketing tool for sports with Ballmer's help, but it needs to become a future crowd funding bank as well! Will Disney buy Netflix and why? In my last article on Netflix I hypothesised that Apple might buy Netflix for its ecosystem and I ended my article by saying that Amazon might merge Netflix with Amazon prime and use the superior platform and ease of use. What was I thinking. In the last few days Disney's stock has tanked to $108 a share from $122 a share (now it's coming back at $111 a share )because of the new trend (sorry speeding up trend) of unbundling here in the U.S. More and more consumers just consume content through their iphone or android or iPad or laptop. It is no longer bizarre to see people watching content on a train in a Los Angeles Starbucks or at home on their device or on the London tube. The television is becoming extinct. Being forced to watch 175 channels of which you only watch 4 and with nothing worth watching on the television the broadcasters have missed the trend by living in the past like a dinosaur. Now. My point is ESPN was the juggernaut that kept Disney cash pouring in, just like HBO for Warner Bros but what we are witnessing is concentric rings of interest. where a human watches what they want to watch when they want to watch it. The disrupters get this and offer the consumer content on the consumers terms. Well Disney has recently struck more and more deals with Netflix to distribute content and Netflix gets older content from Disney which is not competing with dinosaur content distributors. But just imagine if Disney I mean Bob Iger the genius behind the acquisitions of Star Wars, Marvel etc took one last gamble and created an apple type ecosystem for his content. If Disney bought Netflix and it wouldn't be cheap $52 billion this week he could grow his pipeline of content into future platforms using Netflix. I had a theory that the telcos who own the delivery system would end up owning content as people want content not necessarily the branded pipelines. But Disney creates content and content is king but only if you own the distribution of it the platform. More and more platforms will appear all doing the same things with content but Netflix has left the gate first and has momentum. It may not have the latest content but that is only a matter of time and with Disney's help it would compound. So what in god's name does this have to do with crowd funding or crowd sourcing. Well Disney has its brands which turn out tent pole movies which cost $100 million and upwards what it doesn't have is a kickstarter for content. WIth a Netflix purchase it has analytics which tell you what you like, where you live, how much you watch it, who your favourite actor is, your blood type just kidding in other words it is research and development to crowd fund content with a platform and a new business. Kickstarter has done a great job of funding new film makers and existing celebrity filmmakers what Disney and Netflix can do is make stuff that concentric rings of interest want to watch other than the big tent pole movies. If the studios and Hollywood agents could back every horse they would own it all but what we are now seeing is that You Tube is becoming the place where you post your ideas, your video, your story and see if there is an audience once you have an audience Hollywood offers you a deal you can't refuse but what Netflix does is monetise it in 100 countries with an audience of 65 million people who then binge on it like it's an all you can eat content buffet. Netflix might just buy Disney one day! markets to offer UK investors a chance to do so. into one big accelerated charge across the Rubicon. blockbuster model of venture capitalists and banks. fails such as those investing in games development. mass and looks as if it’s here to stay. to capital and expertise from local investors. expects to reach $90 billion by 2025.
in unlisted emerging and frontier market companies. up to a maximum of £4 million in a 12-month period. locally relevant content via their mobile device and desktop. emerging markets,” said Emma Kaye, CEO Bozza Media. and will be forever associated with such a fail. their businesses will be lucky to survive.